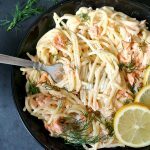 Alfredo Pasta with Salmon, an amazing under 30 minute recipe, perfect for a lazy day when you fancy something yummy, but can’t be bothered to cook anything too complicated. It requires minimal preparation and only a few ingredients, and can make happy even a picky eater. It really ticks all the boxes. Back to spaghetti, oh yes! Whenever l seem to run out of ideas what to cook, a packet of spaghetti always comes to the rescue. And it never lets me down. I could honestly cook spaghetti every single day without getting bored of them. Sounds familiar? You can admit it, no one would ever judge you, spaghetti are too delicious. 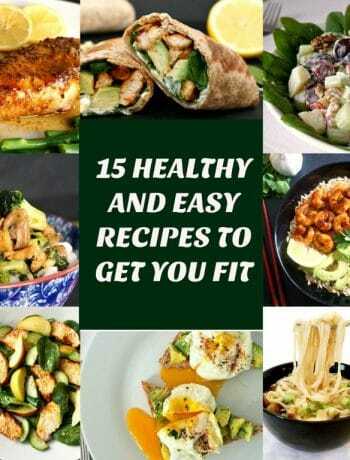 A balanced meal is far more efficient in the long run than those diets who promise you eternal beauty and a slim body. That’s not just what I think, but the general opinion. Don’t ever believe in diets, they never help. This alfredo sauce is so delicious, and so ridiculously easy to make, it would be such a shame to buy a ready-made sauce from shops. And it’s so versatile, you can add any type of cheese you like, although parmesan is just wonderful. I only added double cream (heavy cream), but butter can also be added. My thought was the the cream is already rich and heavy, thus was no need for extra richness, but it’s up to you. I honestly can’t tell them difference in taste. And what makes it perfect, it’s the garlic. Oh, yes! Make sure the garlic is minced, or use garlic paste if you wish, it will bring so much more flavour than just chopped garlic. All you need to do is add the cream to a pan, add the garlic, parmesan, season to taste, and that’s it. That’s the alfredo sauce. How to do you make salmon alfredo? For my recipe l opted for fresh salmon baked in the oven. It’s healthier, it’s tasty, no need for anything fancy. Or you can choose smoked salmon, that’s another good option. Perhaps even canned salmon. Once the sauce is ready, mix it with the pasta that had been cooked according to the pachet instructions, then flake the salmon and add it to the spaghetti. Dill is the best herb to garnish this dish, salmon and dill are a match made in heaven. And if you add a tad of lemon juice, you know you are in for a treat. They balance well the richness of the cream, bringing a fresh touch to the dish, which could otherwise feel a tad heavy. But it’s so delicious. I have tried the alfredo sauce before, but with chicken, I have a lovely recipe here: Chicken alfredo pasta with sun-dried tomatoes and spinach, and I licked my fingers clean after having a rather generous portion, so I knew there will be a second time. 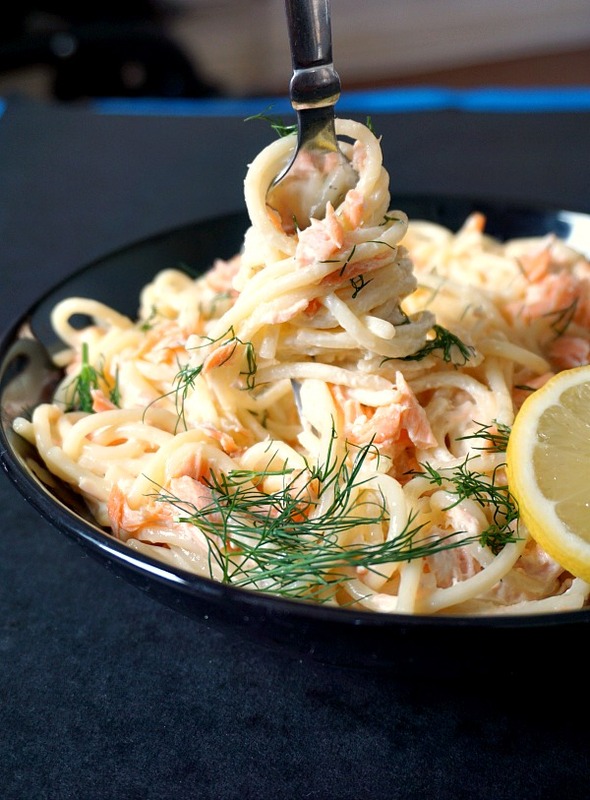 If you’ve tried my ALFREDO PASTA WITH SALMON or any other recipe on the blog then don’t forget to rate the recipe and let me know how you got on in the comments below, I love hearing from you! You can also FOLLOW ME on FACEBOOK, and PINTEREST to see more delicious food and what I’m getting up to. 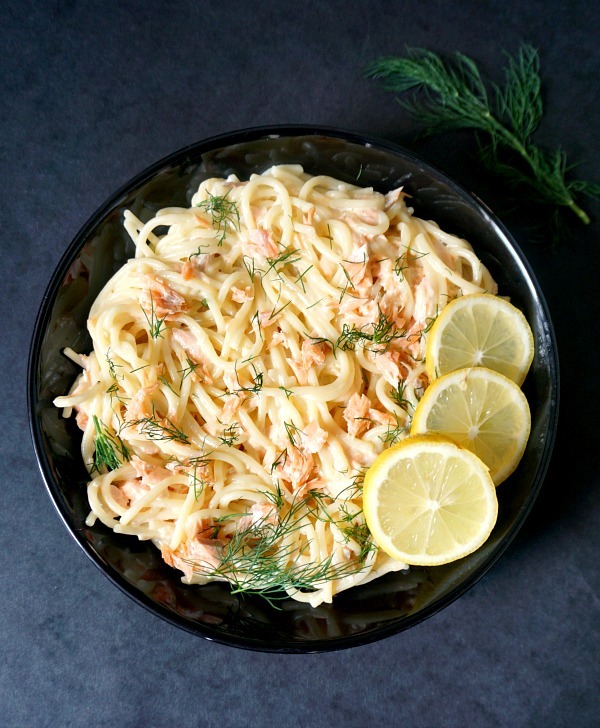 Alfredo Pasta with Salmon and dill, an amazing under 30-minute recipe that is sp delicious. Creamy alfredo sauce, healthy salmon and a touch of freshness from lemon and dill; what a treat! Preheat the oven to 200 degrees C/ 390 degrees Fahrenheit. Wrap the salmon fillet in kitchen foil and bake for 20 minutes. Meantime, cook the spaghetti according to the packet instructions. Retain one quarter of cup of the cooking water, and drain the rest. In pan, add the double cream and garlic and bring to a boil. Toss the spaghetti to coat, add the cooked water, parmesan, and season with salt and pepper. 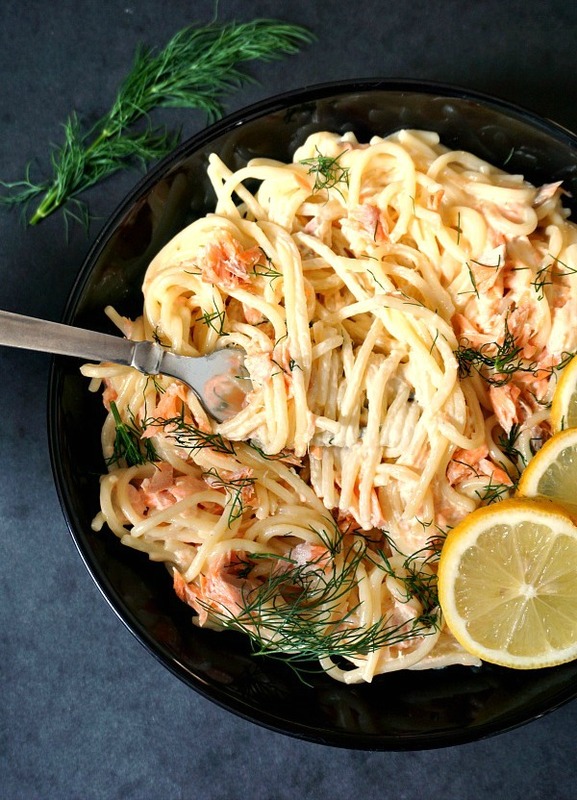 Remove the salmon from the oven and use a fork to flake it, then add it to the spaghetti together with the lemon juice and mix everything well. Transfer to a plate and garnish with chopped dill. I agree that I would rather eat a bowl of pasta! Love the flavors here, it looks so good! 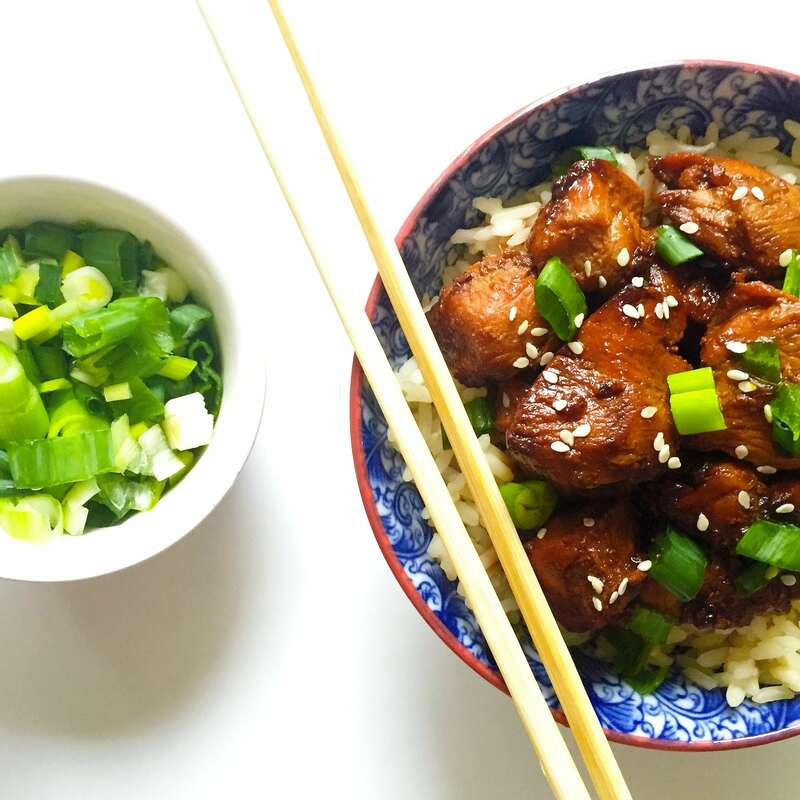 This would make a great weeknight dinner, so quick and easy. I love the combination of salmon and dill. 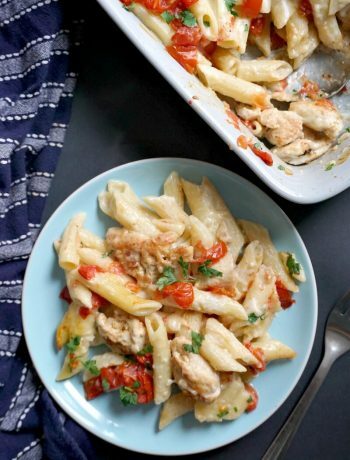 I love alfredo sauce pasta recipes, and I adore salmon so this is right up my street! Spaghetti holds a creamy sauce so well and fresh dill is just delicious. I love it!